Gov. Paul LePage speaks to members of the community during a drug summit at Crosspoint Church in Bangor in July 2017. Gov. 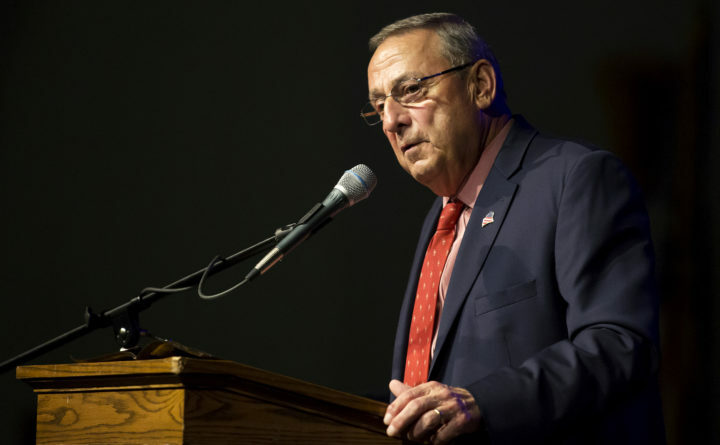 Paul LePage has decided to withhold what is likely more than $8 million in federal funding from three regional boards that oversee job training services for low-income adults, laid-off workers and struggling young adults, according to a workforce development official. If the rejection of funding is finalized, it would mean the end of career counseling, job training and education, on-the-job training and work experience services that a couple thousand people across the state receive each year through their local career centers, said Joanna Russell, executive director of the business-led Northeastern Workforce Development Board, which manages the federal funding for job training services in Penobscot, Piscataquis, Hancock, Aroostook and Washington counties. It would mean that people already attending classes, such as training courses to become medical assistants or welders, would have to end them within the coming weeks, as money to pay the tuition runs out. Maine’s three workforce development boards, which convene businesses and education organizations to get unemployed and underemployed people into jobs, would close. And it would eliminate a major funding source for local organizations in each region that carry out the training. “Given the success of our system in helping Mainers enter employment, the decision to turn away such critical funding is incomprehensible,” said Antoinette Mancusi, deputy director of Coastal Counties Workforce Inc., based in Brunswick. It oversees training on behalf of Coastal Counties Workforce Board for job seekers in York, Cumberland, Sagadahoc, Lincoln, Waldo and Knox counties. Currently the three regional workforce boards, which are all led by businesses, receive funding from the federal Workforce Innovation and Opportunity Act to pay for clients’ job-help services. They don’t receive state funding. LePage has tried twice to replace the boards with one statewide board, most recently on July 11, and both times the federal government has rejected his request because he didn’t work in collaboration with local decisionmakers, the U.S. Department of Labor said. LePage’s decision to withhold the federal workforce development funding appears to be a response to the most recent rejection from the U.S. Department of Labor to form one statewide board. The news that Maine would not use the already-allocated workforce development funds came in the form of a courtesy phone call from Ed Upham, director of the Bureau of Employment Services at the Maine Department of Labor, to Russell, at the Northeastern Workforce Development Board, on Friday, Russell said. Upham told her that LePage had sent a letter to the federal government informing it that the state would no longer participate in WIOA Title 1B, which governs the workforce boards’ activities. The LePage administration has not announced its decision publicly and did not return three phone calls and an email from the BDN Friday afternoon. The U.S. Department of Labor confirmed that it received LePage’s letter but declined to comment on it. Russell said it was too early to determine how the workforce boards or the federal government would respond. Between July 2015 and June 2016, 2,132 job seekers — 987 low-income adults, 546 laid-off workers and 599 youth — received some type of free, personalized help with learning a marketable skill. Typically the state has received about $9 million in federal funds each year. Given that programs have already begun this year, Russell estimated Maine would lose roughly $8 million. The boards compete for additional grants to help job seekers, and their WIOA funds pool with a wider array of funding for career center clients. Without one major source of funds, the other services will suffer or disappear, Bourret said.